Carrier shakes hands with GOAL and Lufthansa in latest financing deal. Vietjet Air and the GOAL German Operating Aircraft Leasing GmbH & Co. KG (GOAL), a joint venture between KGAL GmbH & Co. KG (KGAL) and Deutsche Lufthansa AG, signed a strategic agreement paving the way for GOAL to finance Vietjet’s acquisition of four brand-new A321 aircraft worth $464 million. Vietjet President & CEO Nguyen Thi Phuong Thao, Vietjet Vice President Dinh Viet Phuong, KGAL CEO Gert Waltenbauer, and GOAL Managing Director Jochen Baltes represented the parties in signing the contract, witnessed by Prime Minister Nguyen Xuan Phuc and high-ranking officials from Vietnam and Germany. 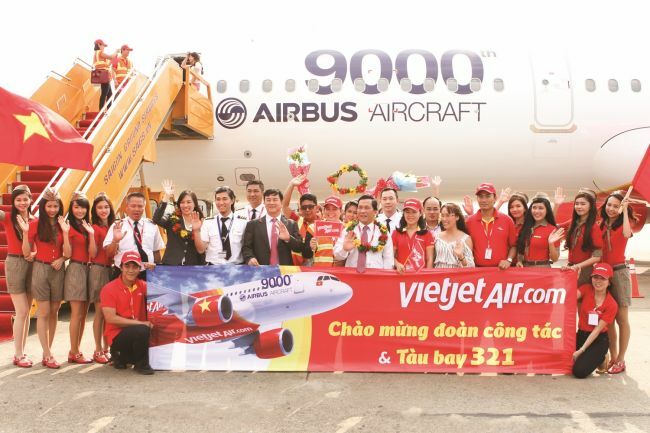 The acquisition of the four aircraft is part of the A320 contract signed earlier between Vietjet and Airbus. Vietjet will receive the four aircraft within 2017 to meet expansion plans in its domestic and international network. Vietjet recently signed a similar deal with Mitsubishi UFJ Lease & Finance Company Limited (MUL), a member of Japan’s leading finance group Mitsubishi UFJ Financial Group (MUFG) to finance its acquisition of three brand-new A321 aircraft worth $348 million. At the Paris Airshow 2017 in France last month, Vietjet also signed a deal with Safran for its SFCO2® fuel efficiency solution. The SFCO2 service contract covers Vietjet’s entire fleet and will enhance its operational efficiency by reducing fuel consumption and CO2 emissions. Meanwhile, in May in the US, Vietjet also signed a series of deals worth a total of $4.7 billion to secure maintenance support for engines, components, and other technical services, including auxiliary power unit (APU) supply and APU technical maintenance and aircraft financing (and/or purchasing). KGAL GmbH & Co. KG is one of Germany’s leading investment companies and a high-ranking player in the world of structured asset finance and investment participation, while Lufthansa is one of the world’s premier carriers. GOAL currently owns and manages 60 aircraft and has broad experience in its core business of operating leasing, technical asset management, and aircraft re-marketing, and has proven its professional know-how since its foundation in 1998.